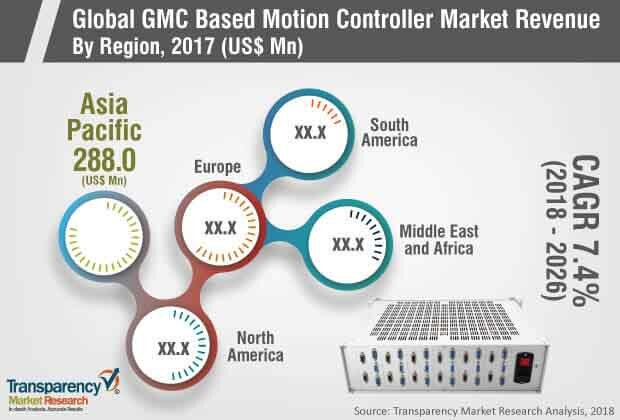 According to a new market report on GMC-based motion controllers, published by Transparency Market Research, the global GMC-based motion controller market is expected to reach US$ 1,542.7 Mn by 2026, expanding at a CAGR of 7.4% from 2018 to 2026. According to the report, the global market will continue to be influenced by a range of macroeconomic and industry-specific factors. Asia Pacific will continue to be at the forefront of global demand, with the market in the region growing at a CAGR of 9.2% through 2026. The global GMC-based motion controller market has witnessed massive growth in the last decade. The primary factor driving the GMC-based motion controller market includes high investment in research and development activities by industry players. With the increasing competition in the global market, key players are indulging in research and development in order to manufacture advanced and innovative motion controllers to differentiate their products from other manufacturers. In today’s market, customers are not just demanding technically compatible products, but much more than that. In order to fulfill demanding customer requirements, manufacturers continue to add smart technologies to their equipment, improve process efficiency, reduce downtime, and increase product quality, which in turn is opening up new opportunities for the use of GMC-based motion controllers. The global GMC-based motion controller market is broadly segmented in terms of type of axis, precision, network communication, product, application, and region. By type of axis, the market has been segmented into multi axis, and single axis. The multi axis segment is anticipated to be the highest revenue contributing segment in 2017 with 57.9% share of total market revenue and is expected to rise at a significant CAGR of 7.5% over the forecast period. This is mainly due to increasing demand for power efficient motion controllers among end-use industries. In terms of precision, the market has been divided into very high precision, and standard GMC-based motion controllers. The very high precision segment is expected to grow tremendously at a CAGR of 7.6% due to growing demand for accuracy and efficiency in industrial processes. By product, GMC-based motion controllers can be divided into PLC-based motion controller, stand-alone motion controller, and PC-based motion controller. The PLC-based motion controller segment is anticipated to register highest CAGR growth over the forecast period, majorly contributed by the cost efficient solutions offered by these devices. By network communication, the market can be categorized into EtherCAT, EtherNetIP, PROFINET, and others. The market share of EtherCAT is estimated to increase at the highest CAGR during the forecast period. This is mainly due to superior performance and synchronicity features of these network protocols for motion control applications while also providing simplicity in implementation. Based on application, the global GMC-based motion controller market has been segmented into electronics and assembly, food and beverage, medical and scientific, metrology, flat panel display, machine tools, packaging and labeling, printing, robotics, non-industrial application, semiconductor, and others. Flat panel display application dominated the market in 2017 and is estimated to rise at a healthy CAGR of 9.5%, reaching market value of US$ 28.8 Mn by 2026. Presence of numerous market players and significant number of small and medium sized industries in the global market is a primary factor for the adoption of GMC-based motion controllers. Asia Pacific contributed the largest market share toward the global GMC-based motion controller market and is anticipated to expand at the highest CAGR of 9.4% during the forecast period.The growth in this region is anticipated to accelerate due to increasing foreign direct investment in developing countries such as China, and India. The research study includes profiles of leading companies operating in the global GMC-based motion controller market. Market players have been profiled in terms of attributes such as company overview, financial overview, business strategies, and recent developments. Some of the prominent players in the GMC-based motion controller market include ABB Ltd., Allied Motion Inc., Delta Electronics, Inc., Fuji Electric Co. Ltd, Mitsubishi Electric Corporation, National Instruments, Inc., Omron Corporation, Rockwell Automation Inc., Schneider Electric S.E., Siemens AG, Toshiba Corporation, YASKAWA Electric Corporation, and Yokogawa Electric Corp. Companies are focusing on expanding their business through strategic acquisitions and partnerships with several end-use industries.